L-Trytophan is an essential amino acid and as such is not synthesized by the body. It must therefore be obtained from the diet. It is critical for the production of serotonin and melatonin, hormones that are concerned with mood and stress response, and which work to support healthy sleep patterns, a buoyant mood and a well-functioning immune system. Each capsule provides 220mg easily absorbable L-Tryptophan. Take two capsules daily or as directed by your medical advisor. L-Tryptophan, Bulking agent: Microcrystalline cellulose, Anti-caking agent: Magnesium stearate, Vegetable HPMC capsule. Collagen is the most abundant protein in our body, making up about 30% of protein in the living body and 70% of protein in the skin. It is made up of amino-acids: glycine, proline, hydroxyproline, and arginine. Starting in our mid-20s, natural collagen production starts to decline by about 1-1.7% each year and is not replenished. 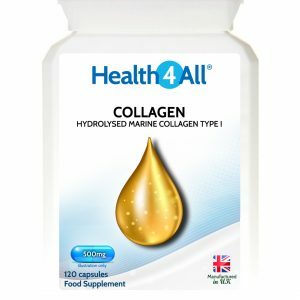 By age 40, we have lost 10%-20% of our collagen, by 50, we are down 20%-40%. Our capsules contain hydrolysed collagen peptides, tiny 2-5kDa molecules which are easily absorbed (according to studies more than 90% is digested and available in the blood stream within one hour).